For hard working hands and feet that need to feel gentle. 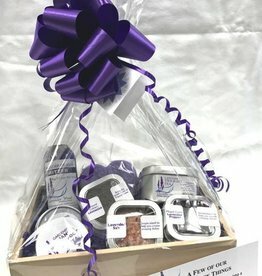 This handcrafted cream is made with natural oils carefully chosen and combined to help your skin after working in the garden, the house, or on the job. The wonderfully fresh lavender smell makes this cream a joy to use. We use natural oils and our own hydrosol to make this cream. We don't use any colorant in the cream. Because of the variability in color of the ingredients the color of the cream varies. Large has 4.6 oz of cream inside. Ingredients: Olea Europaea (Olive) Fruit Oil, Prunus Dulcis (Almond) Oil, Cocos Nucifera (Coconut) Oil, Simmondsia Chinensis (Jojoba) Seed Oil, Persea Gratissima (Avocado) Oil, Olive oil infused with Calendula, Cera alba (Beeswax), Aloe Barbadensis (Aloe) Leaf Juice, Tocopheryl Acetate (Vitamin E),, Potassium Sorbate, Green Tea Infusion, Polysorbate 20, Phenoxyethanol (and) Caprylyl Glycol (and) Sorbic Acid, Rosmarinus Officinalis (Rosemary) Leaf Extract, & Essential Oils. 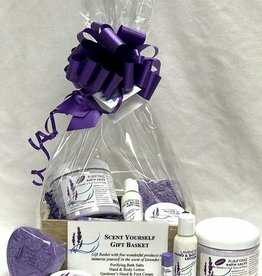 What a great gift for your lavender lover.